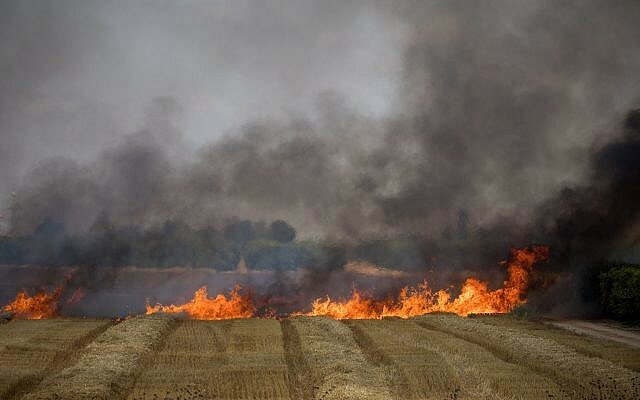 The Arabs of Gaza have set over 250 fires, burning nearly seven square miles of land (4,300 acres), more than half of it in nature reserves, in what has turned out to be the latest piece of Arab terrorist innovation: Environmental terrorism perpetrated through the release of kites – decorated with swastikas – and helium balloons on fire. It has become known as “kite terror”. The fires, specifically those in nature reserves, have also wreaked havoc on local wildlife, so that not only humans pay the price for the Gazan Arabs’ unceasing rage, but also animals. Just as the Arabs of the PLO invented modern day terrorism – airplane hijackings, airport massacres, school and school bus massacres, athlete massacres, suicide bombings, especially of buses, restaurants and nightclubs, car ramming attacks (also known as vehicular jihad) – the Arabs of Hamas in Gaza, have innovated environmental terrorism (in addition to inventing terror tunnels and perfecting the war crime of using civilians as human shields). Knowing how the rest of the PLO inventions have traveled the globe and ended up being used by other Muslim terrorists in both the US and Europe, the tactic may yet become a Gaza export. The damage done by the fires is estimated to be at least NIS 5 million ($1.4 million) to farmland alone. It will take years, perhaps even decades, to return the afflicted areas to their prior state. The fires wrought by the Arabs of Gaza serve as a crucial, if extremely painful, lesson in what they would do to the rest of the land of Israel, if they were ever to receive more of it. When Israel left the Gaza strip in 2005 (a fact that appears to have eluded most of the world’s social justice activists), effectively rendering Gaza Judenrein, the Arabs there destroyed most of the greenhouses left behind, only because they had been built by Jews. They did not develop anything in Gaza, but merely turned it into a jihadist base from which to launch terror attacks and rockets at Israel. How is that for “love of the land”? The kite terror perpetrated on the beautiful nature and fields of Israel is an example of what the Arabs of Gaza would do to the rest of Israel if they ever got the chance. They would literally “love” the land to death, until it would become – once again, as it was before the Jews arrived in numbers to rebuild and resuscitate the land from the lengthy Muslim colonization of it – arid, its natural resources depleted and exploited, waiting for someone to make it fit for human living. As observations of 19th century travelers to the region attest to, after 400 years of Ottoman Turkish occupation of the land of Israel, the country was not only mostly empty of Muslims (who only came when the Jews began to bring the land back to life) but the country also sat “in a sackcloth and ashes. Over it broods the spell of a curse that withered its fields and fettered its energies. …Palestine is desolate and unlovely….It is a hopeless dreary, heartbroken land” as American author Mark Twain wrote in his description of his visit in 1867. This was because the Ottoman Turks neglected the land in their utter disdain for it. Turkish President Erdogan’s “love” for Jerusalem is a very recent invention. If the land truly belonged to the Arabs and if they actually wanted it for its own sake, as opposed to just ousting and killing the Jews in it, they would never consider destroying its nature and wildlife. As in the judgment of Solomon, in which the king ruled between two women both claiming to be the mother of the same child, the woman who readily accepted that the child be cut in half, could not possibly be the child’s biological mother. No mother would do such a thing to her own child. The Arabs can claim the land as theirs as much as they want – the world, after all, readily believes the lies – but their destructive behavior towards it betrays the reality. Such a good article. Unfortunately the logic and facts fall on deaf anti jew ears. Great article… I believe, with many, that God’s favour moved away from the land on the departure of His people, and only returned with their return to the land. ..and I’m not underplaying the great suffering and lives given to reclaim it. It is only at the hands of the Israelis that the desert will blossom, because God’s blessing is on you as a nation. You have His mandate not only to succeed internally as a nation but also to be a “light unto the world” and a blessing to all nations. Let no other nation, feel they can supplant you….look at Gaza …the greenhouses and what was blooming there has been utterly destroyed. They have no heart for this land..their objective as you so rightly said is just the annialation of Israel, as a nation! Yes…Land for peace is no solution, and never wil be.